Toasted Italian Sub Sandwich - A sub sandwich with thinly sliced roast beef, ham, salami, pepperoni, lettuce, tomato, onion and provel cheese with oil and vinegar dressing on a toasted hoagie roll. It comes with a choice of side. 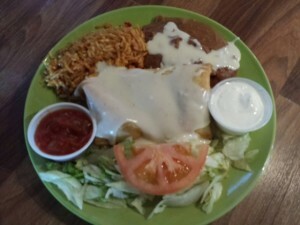 Chicken Chimichanga - Shredded seasoned chicken rolled in a flour tortilla and deep fried, topped with sour cream and served with a side of Spanish rice and refried beans. Shrimp Skewers over Rice - grilled shrimp skewers served on a bed of rice with broccoli florets. Mexican Burger - One of our huge burgers cooked to order, with cheddar cheese, rice & beans and served in a warm flour tortilla and topped with lettuce and tomato. Comes with side of black bean salsa. Rattlesnake Pasta - Pasta with a bite with chunks of chicken breast, bell peppers, diced onions and jalapenos, served in a spicy alfredo sauce. Comes with a side salad. 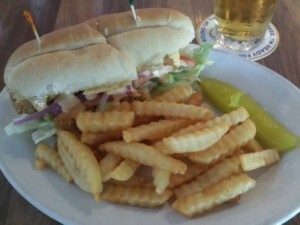 Buffalo Chicken Sandwich - A chicken breast, either grilled or breaded and fried, tossed in our house made hot sauce on a toasted roll with lettuce, tomato and onion. Comes with choice of side. 2 Topping Pizza - One of our 9 inch thin crust pizzas with your choice of 2 toppings. Comes with a side salad. Fried shrimp Po' Boy Sandwich - loads of fried shrimp on a hoagie topped with lettuce, tomato, red onions and our own creamy Cajun hot sauce. Comes with your choice of side. Beef Tacos - It's a simple one, soft shell beef tacos with lettuce, tomato, cheddar cheese and seasoned ground beef. Comes with a side of chips-n-salsa. Chicken, Bacon & Ranch Quesadilla - grilled chicken and bacon with a blend of cheeses all tossed in ranch dressing and then folded into a warm flour tortilla and cooked until the cheese melts.